As the pool pump circulates the pool water, the water pulled from the pool passes through a filter and the pools heat pump heater. 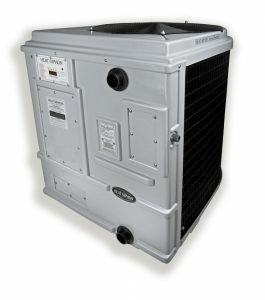 The heat pump pool heater has a fan that draws in the outside air and directs it over and through the evaporator coil. Here liquid refrigerant within the evaporator coil absorbs the heat from the outside air and becomes a gas. The warm gas in the coil then passes through the compressor. The compressor increases the heat, creating a very hot gas that then passes through the condenser. The condenser then transfers the heat from the hot gas to the cooler pool water circulating through the pool heater. The heated water then returns back to the pool. The hot gas, as it flows through the condenser coil, returns to liquid form and back to the evaporator, where the whole process starts all over again. 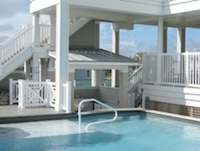 Heat pump pool heaters work efficiently as long as the outside Air temperature remains above the 45ºF–50ºF range. The cooler the outside air they draw in, the more energy they use. Since most people use outdoor swimming pools during warm and mild weather, this usually is not an issue. 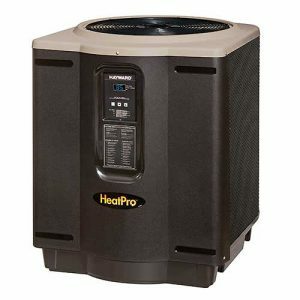 Heat pump pool heaters normally cost more than gas pool heaters, but they typically have much lower annual operating costs because of their higher efficiencies. With proper yearly maintenance, heat pump pool heaters typically last longer than gas pool heaters. and typically costs a lot less to operate. Therefore, you will save a lot more money in the long run. Designed for maximum protection against chlorine, bromine, and other corrosive pool chemicals. Heat Siphon units are backed by a Lifetime Factory Warranty on its titanium heat exchanger, and 5 years on its compressor. A Heat Siphon heat pump will effortlessly raise your pools temperature into the 80-90 degree range, and/or your spa to 104 degrees. In addition to heating the water, the swimming season can be extended in cooler climates by as much as 50 percent, plus a HEAT SIPHON unit performs well year round in warmer geographic locations. HEAT SIPHON units require little to no maintenance, and typically last 7 to 10 years. 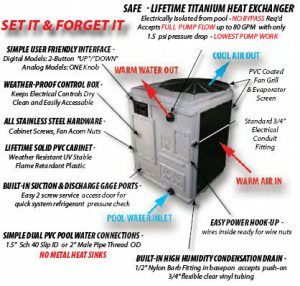 Sizing a heat pump pool heater involves many factors. Basically, a heater is sized according to the surface area of the pool and the difference between the pool and the average air temperatures. Other factors also affect the heating load for outdoor pools, such as wind exposure, humidity levels, and cool night time temperatures. Therefore, pools located in areas with higher average wind speeds at the pool surface, lower humidity, and cool nights will require a larger heater. Heat pump pool heaters are rated by Btu output and horsepower (hp). Standard sizes include 3.5 hp/75,000 Btu, 5 hp/100,000 Btu, and 6 hp/125,000 Btu. Determine your desired swimming pool temperature. Determine the average temperature for the coldest month of pool use. Subtract the average temperature for the coldest month from the desired pool temperature. This will give you the temperature rise needed. Calculate the pool surface area in square feet.